Soak rice for 20 minutes and drain it. Heat ghee and oil in a wide pan, and add cloves,cinnamon,bayleaf and fennel. Now,add onion and fry well till it become transulent. Add crushed pepper corns and fry for few minutes. Green chillies can also be used instead of pepper corns. Add ginger garlic paste and fry till raw aroma leaves. Now,add drained rice and fry it till the colour changes. Stir the rice continously with gentle for about 3 minutes. Add hot water and let it boil and add salt. Cover the pan when water boils and keep in low flame for 10 minutes. Check if water is absorbed and switch off flame. Let it be for 10 minutes and the open the pan. Fluff rice gently with fork and garnish it. Garnish with coriander leaves,fried cashews,raisins and onion. Add pinch of garam masala to enrich the taste and flavor. Add half cup of hot water if rice is not cooked well. Leave it for another 5 minutes in low flame. This South Indian Recipe is perfect for lunch and dinner. 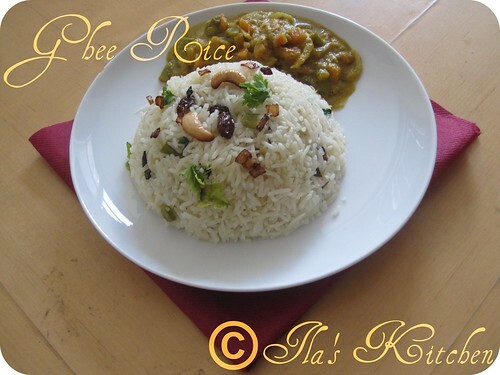 Ghee rice can be served with Vegetable kurma. I am also sending this recipe to A.W.E.D. 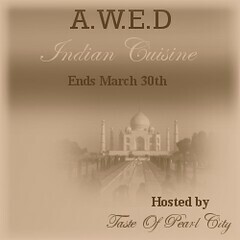 Indian Cuisine Event hosted by Umm and originated by DK. 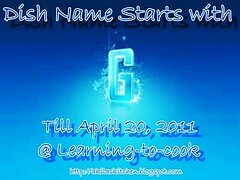 I am also sending this recipe to Dish Name Starts With G Event started by Akila. I love Ghee rice any day,your ghee rice look so delicious. 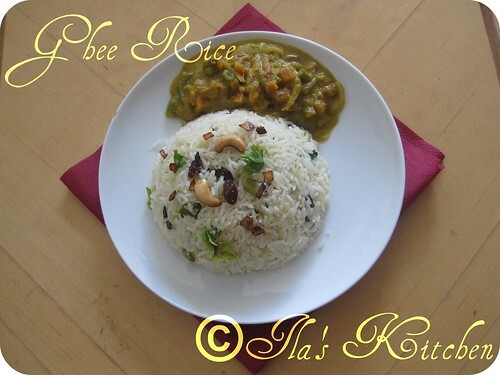 Aromatic and delicious ghee rice. Yummy ghee rice... So tempting and very good photography! Ghee rice looks awesome delicious. Hi Ila....rice looks really delicious...there's an award galore waiting for u in my space...pl accept it ! Ghee rice looks super !!! I am planning to try this for my hubby's lunch box. will try soon. bookmarked !! So so yummy looking rice! wish I could have that plate of rice! following you. My link did not work previously. Had some problem. Don't know what. Love the flavorful rice and what an awesome click. Do visit mine when you find time. Looks so tempting and very inviting !! Fabulous recipe!!! Love the aroma & flavor!! Ila This rice looks too yummy! thanks for dropping by my space dear ! you have a wonderful space here ! will surely try this version...sounds tempting..
stop by n collect an award plz..
Ghee rice looks yummy...nice presentation too. looks delicious.. very nicely presented.. looks tempting..